things worth noting/ zooming in about are the “natural products” lines on the left which were systematically bought out by corporations (such as Coca Cola, Pepsi, General Mills, and Kellogg) as part of their strategic green-washing campaigns. 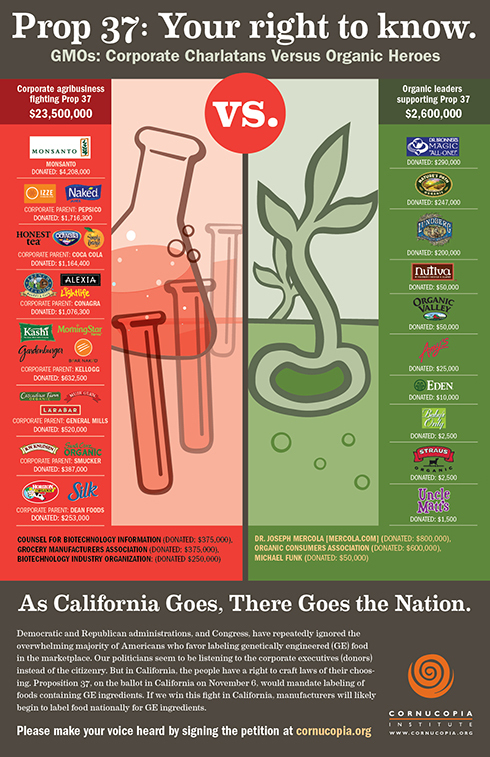 Those supporting the organic food industry on the right of the poster include Organic Valley, Dr.Bronners, and Eden Foods. For those of you voting in California, Prop 37 would require GMO labeling and increase transparency about the processes under which food is grown. Vote YES on Prop 37, November 6th. This entry was posted in food justice, growing food, health, organic foods, politics and tagged corporate buyouts, GMO crops, greenwashing, organic food, prop 37. Bookmark the permalink. Reblogged this on Black Maps: science + politics + comics + maps.